Starting online business each entrepreneur most probably admits the success laying in everyday hard work and dedication. However, the final results depend not only on how much time and efforts one could invest in the business. The basic issue, which business owners face while launching e-stores, is selection of the e-commerce platform. Estimating different options an entrepreneur should beforehand decide for oneself which size, design, SEO / visibility, and budget should be applied to the project. Dozens of e-commerce platforms available in the market obviously justify the absence of a single-for-everyone-fitting solution. Each platform provides different features being designed for a variety of tasks. The comprehensive method in such a case implies a comparison of different solutions basing on their advantages and negatives. 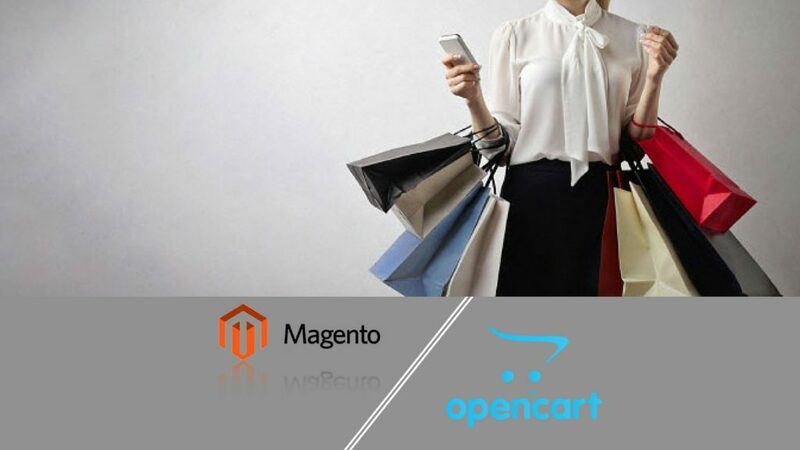 Once Magento and OpenCart platforms are undoubtedly the most popular ones among e-commerce solutions it seems worthwhile to investigate their features sequentially. Magento possesses about 30% of the e-store websites market that makes it the leading solution nowadays. By virtue of such popularity, Magento is followed with the largest group of independent developers providing the platform’s users with the unlimited applications and plug-ins. Due to its hyperbranched infrastructure Magento requires a strong hosting plan supporting its websites performance. Back-end hosting on a separate server is highly recommended. However, such a resources-consuming structure allows the Magento-based e-stores to compete at the highest market level providing customers with the most customized shopping ever along with powerful SEO resources. Such features as order history, recently reviewed products, and wish list enhance Magento e-store visitors for advanced shopping while business owners are supported with multiply stores’ management from a single administrative area. Magento practices the certification of the third-party developers to offer the guarantied up-level service to the customers without strong proficiency in PHP facing some stumbling due to the platform’s complexity. Anyhow, the richest customization along with super flexibility seems worth extra expenditures for professional developers capable to reveal all potentialities of Magento platform for e-store entrepreneurs. Having a smaller community and lower developers’ support OpenCart on the other hand is much easier for programming. The platform’s tools and features are intuitive and simplified allowing users to launch e-stores without exterior help in most cases. Being more appropriate for small and medium size businesses OpenCart hosting is cheaper due to the platform’s light weight. It seems that namely its straightforwardness makes OpenCart occupying the second biggest part of e-commerce website market (about 25%). Online support and tutorials of the platform are proliferating whereas OpenCart continues growing with number of users. Although OpenCart offers various extensions, its SEO is still far from the one Magento provides. The limitations about custom URLs and modifying metadata along with slender templates’ customization imply rather long way OpenCart is to go yet. Being great for quick start-ups and easy to deploy OpenCart might constrain a business while it outgrows a certain scale however. Magento is illimitable with regard to e-store business development requiring nevertheless cost-consuming support of professional developers due to the platform’s complexity. Each business owner is to weight up options making a choice among the solutions. 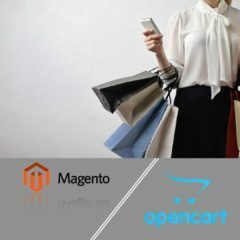 Some business projects may require low-cost and easy-to-run OpenCart platform while the other would prefer the unlimited growth opportunities and incomparable flexibility of Magento. In both cases, the advanced assistance and detailed consulting from Agiliway developers will provide the beneficial approach leading to successful e-store start-up.